Now, lovage is an integral part of my kitchen garden! This is the 1st post in our Forgotten Plants series — plants that were once prolific in the kitchen gardens of our ancestors, but now are so rare that the average person hasn’t even heard of them. Many of these plants deserve to find space in our gardens again! Did you know that Charlemagne believed that lovage was a must-have for all royal gardens? Yes! The history of lovage dates back hundreds of years — and spans continents. Colonists first brought it to the New World. My father-in-law actually recognized the plant immediately because it used to grow outside his grandmother's house — although he's not sure if she used it in the kitchen. Lovage belongs to the same plant family as celery. Its dark green leaves grow on thick stalks, like celery, but with a stronger taste. Its stems are tall and hollow. In the spring, this perennial is one of the first to poke out of the earth, and provides a continuous harvest well into the fall. I grew my lovage from seed planted directly in the garden, but like most perennials it grows by root division as well. 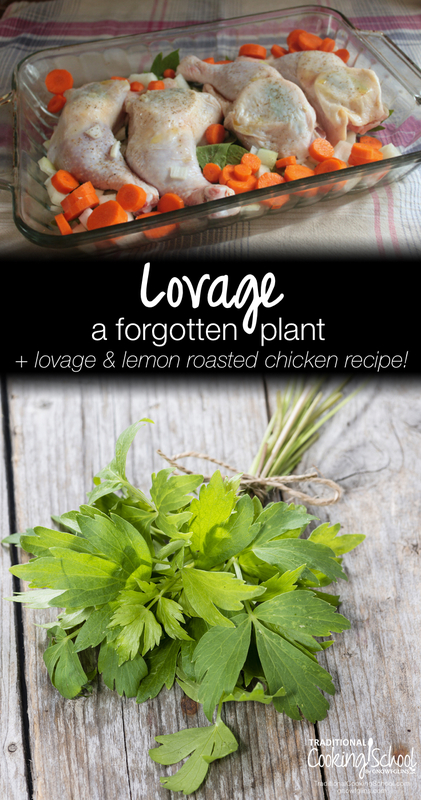 So ask around as see if anyone you know already has lovage growing in their garden! Give lovage plenty of space to grow in a sunny or partially shady location. Keep in mind that they grow tall, too! Mine is about 6 feet. Why exactly does lovage deserve a spot in our kitchen gardens? Reasons abound! Not only is the entire plant edible — from root to seed! — but it has a long history of both culinary and herbal use. Use it as you would celery, except perhaps a bit more sparingly. I regularly add whole stalks to the stock pot, include finely chopped leaves in soups and stews, and add small amounts to egg dishes. It pairs beautifully with either chicken or fish, and a few slices of lemon. Eat the young leaves raw in salads, or peel the roots to eat like a veggie. The hollow stems even make fun straws for summer drinks. I've even read that the ground up seeds make a tasty salt substitute. Additionally, it freezes well, so it can be enjoyed all year round. As an herb, it benefits digestion, aids the respiratory tract, provides relief from rheumatism and urinary tract complaints, and helps with menstrual troubles and poor blood circulation. Isn't it amazing that one plant can do so much?! It seems obvious why the settlers found the plant important enough to bring with them on their long journey to the New World. Are you ready to try lovage? Lay a bed of lovage in the bottom of a large baking pan. Tuck a lemon slice and lovage leaves under the skin of the chicken thighs. Place the thighs in the pan. Sprinkle with salt and pepper and drizzle with olive oil. Throw some chopped onion and carrots in around the chicken. Bake, covered, for 30 minutes, and then uncovered for another 30 minutes, or until the skin of the chicken is crisp. 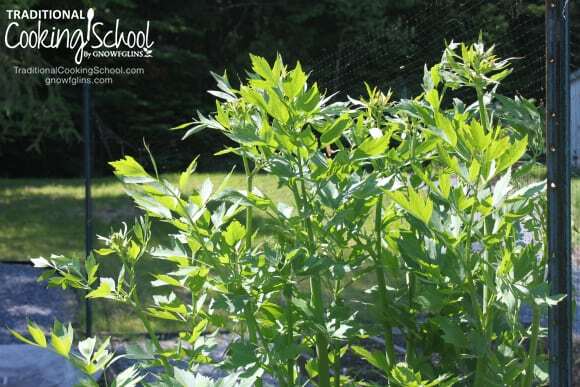 Do you grow lovage, or any other “forgotten plants” in your garden? What are some of your favorite ways to use them? 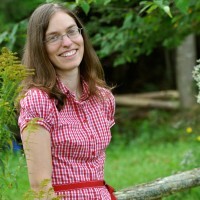 Andrea is an artisan and teacher trying to live a handmade and homemade lifestyle with her husband in Eastern Canada. She is passionate about growing her own food, cooking healthy meals, using herbs for healing, nurturing creativity, and finding joy and blessings in the every-day moments of life. She writes about all of this, plus her adventures in sewing and crafting and bringing children’s drawings to life at Artisan in the Woods. It’s a tall growing perennial?! I would love to try this. I’m trying to use plants like this as windbreaks in my garden. I have a difficult climate though: we have extreme changes in temperature, wet springs, and very dry hot summers (as in triple digits in August, sometimes as early as June). Do you think this would work for me? I’m in zone 6b. It is definitely tall! This year mine is over 6 feet! And it spreads wide, too. I am in zone 5b and so far the lovage has survived our cold winters, wet springs, and seems to be thriving in the hottest temps on record that this summer has thrown our way (although we will never reach triple digits!) The bottom leaves do tend to yellow in hot, dry weather, so that might be an issue, but from what I have read lovage still does well into Zone 7b, so it might be worth a try! I will try it! I located some seeds so I will see if I can’t start them soon and plant it this fall or next spring. We’ve had a problem with wind since we live in an exposed area and I’ve been looking for tall growing plants, preferably perennials that might help protect some of the other crops. I would also love to use this in the kitchen. I think we’d enjoy it. Thanks for sharing! I’m really exited about this. My grandma grew lovage and I finally have some growing myself. I have mostly used it to make soups and to add to salads. I just pulled some chicken legs out of the freezer to make the lovage lemon chicken right away. Thanks so much for the recipe! We LOVED it! This is going to be one of our regularly scheduled summer/fall meals. Thanks again!! I have grown lovage for years, and although it is a little strong for my family’s taste, I give it to my dairy goats along with comfrey and sweet cicely. They love it, and I think these deep rooted perennials pull up the minerals and make them available for us. A little lovage definitely goes a long way! I have never thought of feeding it to animals, great tip! Where do you get seeds for lovage? I grow lovage, but i can never remember to use it! I have the same problem with a few of the edible plants I own! Now I make it a practice to try something new each week until I get into the habit of using everything. I grew up in Eastern Europe and we always used lovage for fish soup. Especially if it is a sweet water fish. My mother in law was visiting a couple of years ago and we had the hardest time finding lovage so she can make us some traditional dishes. I also remember my mom using lovage when fermenting vegetables. She used to make a mix of carrots, red peppers,cauliflower and add lovage to that. It acts as a kind of natural preservative, like celery. Yum! I have never seen lovage being sold anywhere around here, either, as most people I have spoken with have never head of it! I love the idea of adding it when fermenting vegetables – thanks for the idea! I grew lovage in my herb garden for several years. It never got over 2 feet tall and then one year it didn’t come back. I had no idea it could get so tall. I should plant it again. Hmm…perhaps it just wasn’t the ideal spot. Mine was small to begin with, but it’s huge now! It’s definitely worth another try! I love lovage! I have never frozen it, can i just put in freezer bag fresh, or is there other steps I should be taking? I freeze lovage in the same way I freeze celery. I pop whole fresh stalks in the freezer for adding to stock, and then chop some up for adding to soups and other dishes. No blanching or special prep needed. where would you obtain the seeds? Bought a small lovage start last year that I popped in the garden and sorta forgot. This year it has already reached over a foot high in mid-April and was looking very nice so I checked its identity and started to look for some ideas for using it. Think I’ll slice a bunch up and add it to a big pot along with some onion, garlic, salt, pepper and a couple frozen roosters to boil for a day or so. And Jenny needn’t worry about the heat. Here in California, even at over 3,000′ elevation, it gets into the triple digits sometimes as early as May and the lovage seems just fine with it. Now maybe I should see if it goes with peanut butter and honey the same way that celery does. I adore my lovage! I have it planted right next to the house by the back stoop (right next to the chives) so I can send the kids out to grab a leaf or two when I’m making things like tuna/chicken salad, potato salad, soups etc. It gets very tall, but I just hack off the parts that are in the way and it keeps right on growing. Just found you peeps out there using lovage as an edible. I’d read that it is an edible plant, but I’ve never try to use my plant as food. You are all giving me ideas. However, I wonder if anyone else out there has my issue: When I have trimmed or cut down this plant in the fall, I’ve learned I MUST wear gloves! Otherwise, if I’ve touched the plant with bare hands and then happen to get it on my face (scratching an itch or slapping a bug), then my skin, or lips start to sting or itch and swell up a bit at the point of contact. Anybody out there experiencing the same? Perhaps I’m allergic to the plant? I’m certainly NOT allergic to its cousin celery. I love lovage. I remember my grandma using it for almost everything as a substitute of polish Maggi soup seasoning (to me it’s a taste of summer). What I loved the most is a sweet pea soup. She’d make chicken or pork base by boiling a piece of bone with meat in salted water until tender, then add peas. Diced carrots, potatoes, and parsnip. A fistful of lovage goes in when the veggies get soft. The flavors of the soup compliment each other so perfectly that you don’t need anything else but salt. And then thicken the soup with onion thinly diced and fried in 4 spoons of oil, until starts to turn golden, then add 2 spoons of flour. Let it ‘fry’ for almost 2 minutes constantly stirring and add to the soup. Mix well. It took me a while to find lovage here. But now as I did the lovage sweet pea soup is common on our table. Kat, that sounds so good! Thank you for sharing the recipe! I have had my loveage for 15 years. This herb makes me feel like I have a green thumb. I use it fresh from the garden in my stews in its growing season and frozen in the winter. I like it with potatoe salad. I like to dry it quick in the microwave and use some to sprinkle on almost anything. There is plenty of it –that’s for sure. I like it on pizza! I just found your website researching recipes for lovage. I got the plant as a house warming 15 years ago. I have never used it but a friend and I are on an elimination diet together. She needs to eat low FODMAP foods and lovage is that and celery is not. So I gave her some. I just added it to a smoothie and it might just be the best smoothie that I have made. If I had a favorite forgotten plant. Mine is lemon sorrel. I call it free food because I don’t have to anything except pick it and eat it. I put it in soups, salads but mostly I put it in smoothies. I will check out your site more often now. In our area you can buy the plant at your local Agway and a few other nurseries. I planted it last year in May and it was 6ft tall by the end of July! Can’t wait to try this recipe. I’ve been using lovage for years……in soups, stews, chili, etc. I have Lovage and enjoy it quite a bit. Have you ever tried drying it for later use? Just wondered if it would dry well as I try to avoid taking up freezer space. I have not tried to dry it, so I am not sure how it would fare. You could always try drying some and see how it goes! I grow my lovage in partial shade and while it is getting to be a bigger plant each year it only grows about 3′. This is the first year I cooked with it and found out just how potent a flavor it has. I use WAY too much. A little goes a long way. It’s a very gratifying plant to grow, so easy and pretty. I like the idea of using it as a straw (down with plastic!) as mentioned in another comment except that the flavor is so strong! A friend gave me a root division of lovage, but said it was so aggressive the he was afraid I wouldn’t be his friend any more. So I planted in a pot! It only grows to about 4 feet tall and has survived even the coldest of our zone 5 winters. Many potted plants don’t. So if you’re worried about the size of the plant, find a big pot. It seems to be free of disease or pests. Maybe it’s my red clay soil or something but mine hasn’t spread at all except that the clump has gone from a little 4″ or gallon pot (can’t remember) to about 1′ across. And that’s after a few years in the garden here in northern CA, maybe about 5 or so. I just dug it up a few days ago, most of it at least, and heeled in the main clump to be replanted later. Then I potted up four pieces of root with a single little sprout on each. I also brought in a bunch of roots that were broken/cut by the shovel and have googled lovage root recipes. It might not spread a lot or at least not quickly but it does have some big, deep roots, like burdock. But if you use the whole plant, which is edible from the roots to the seeds, you’ll never need to worry about it spreading. At least not quickly. I am wondering how much will re-sprout from the roots I didn’t completely remove.